Cambridge United striker Jordan Slew has admitted he is "nowhere near his best" and insists he is working hard to earn his place in the side. The 22-year-old was transfer-listed by boss Richard Money in May, just three months after signing for the U's. However, the former Sheffield United and Blackburn forward now looks set to remain at the League Two club. "I'm nowhere near my best at the minute. There's a lot more to come from me," he told BBC Radio Cambridgeshire. "It's hard settling in when you come to a new club at first, but I've settled in very well as we've come back into pre-season." After a promising start to his career at Sheffield United, he was sold to Blackburn for £1m in 2011, but only played for them twice and had a number of loan moves away from Rovers. 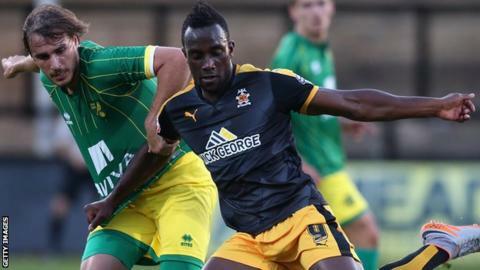 Slew, who scored one goal in 13 appearances for Cambridge last season, accepted Money's decision to make him available for transfer. "It's part of football sometimes. I'm not going to take it personally, it's just part of the business," he added. "I've worked my socks off in pre-season and the gaffer's had faith in me and played me quite a bit. It's all about getting the minutes in. "I just need to keep doing what I'm doing, working hard in training and games and hopefully the gaffer puts me in."